Rosa looked concerned. "Why are you going to Huancayo?" she asked, brow furrowed. Rosa Vasquez Zanetti runs a travel agency out of her family's inn where we were staying, on the Amazon River in Iquitos Peru. Rosa had been so helpful already, I'd asked her to look over our plans for the Andes. "We picked Huancayo at random - because it's a small mountain town with no Americans, and not too far from Lima by bus," I answered. "But...that's not the best plan," Rosa continued, in her soft-spoken way. "For birding and trekking, you should go to Huaraz in the Cordillera Blanca. And you should ride the Cruz del Sur bus from Lima. It travels during the day and makes no stops so it's safer." Night buses that make frequent stops are vulnerable to occasional muggings, as we heard from more than one source. "Stay at Zarela's hostel in Huaraz for a couple of days to get acclimated," Rosa told us. "Then from there, you can go up to Llanganuco Lodge and Llanganuco Lake. You'll like that better than Huancayo." Rosa arranged it all. As it turns out, the Cruz del Sur bus does make pit stops on request (the onboard bathroom is for liquids only, the driver announced). But no scheduled stops. And it didn't freak me out like I feared it would, swooping around mountain curves with no guard rails. I just didn't look out the window. Much of the adobe town was leveled by an earthquake in 1970 that killed 20,000 people in Huaraz alone - half the population. The town has been rebuilt, this time with rebar reinforcement in every wall. In fact, a good proportion of the homes and buildings still have rebar poking out the top. But the funky construction and the steep cobbled streets just add to the town's personality - a blend of local enterprise and Andean indigenous culture, along with the trekkers, birders, and wanderers like ourselves. I spent our time in Huaraz skulking around the town, trying to get pics of Andean street scenes and the beautiful Quechua women who were everywhere, with their long thick braids and brilliantly colored hand-woven clothes and baby-slings. In the afternoons and evenings, indigenous women from outlying farms and villages set up stands or spread blankets on the sidewalk to sell produce or woven items. They all wore traditional fedora-style hats, often with an arrangement of feathers lying flat against the felt. Most of the women didn't want their picture taken, even when I asked politely. But a few acquiesced, a couple of them even asked me to mail them prints. It was a blissful day for me, I can't say why exactly - one of those few days where the world seems a lovely place; I felt grateful to be alive and well. After just one day of acclimating in Huaraz, and scampering about annoying people with my camera, we hired a taxi driver from Yungay to take us to Llanganuco Lodge at 11,500 feet, and later Llanganuco Lake (12,500 feet) in Huascarán National Park. The lodge is right smack at the base of snow-covered peaks Huascarán and Huandoy. At 22,200 feet, Huascarán is the highest tropical peak in the world. I'll tell you about the National Park and the lodge - and altitude sickness - in my next post. Between our amoeba issues along the Amazon and altitude sickness in the Andes, we had a few sick days. But that's all forgotten now. I said in my previous post that I'd move to Iquitos in a heartbeat; I'll have to include Huaraz as well. If a job opened in either place, I'd be gone in a flash. If you're interested in adventure travel, as in someplace really different from home and not too expensive, consider Peru. If you want a ground-level view of what's really going down in the tropical world, Peru will show you that. We're just back from 24 days in Peru, a trip that included the Amazon, the Andes, and the desert along the Pacific Coast. Peru is one of the most varied and stunning countries I've seen. It has the highest biodiversity of any country on the planet - a big bonus for us. We also found opportunities to interact with indigenous people in villages along the Amazon and in the Andes. One of our goals was to spend as much time as possible in places where other Americans don't go - remote villages and nature reserves. We accomplished that, partly by avoiding Machu Picchu and the Sacred Valley. My trip included husband Ken, son Alan, and daughter Sadie. Sadie and Alan are both in their twenties. We saw 301 species of birds in Peru - not bad. Compared to 314 species in Costa Rica (over a period of 12 weeks), 220 in Kenya, and 141 in South Africa. [The Kenya trip was only Alan.] Birds we saw in Peru included the Humboldt penguin, Inca tern, Peruvian booby, Peruvian pelican, blue and yellow macaw, vermillion flycatcher, white-throated toucan, wattled jacana, Andean flicker, white-winged parakeet, burrowing owl, etc. I can post a list if anyone is interested. Leave a comment on the blog and tell me. We spent 4 or 5 days in Iquitos, the world's largest city that's not accessible by road but only by river or air. It's a friendly, hyper, and funky little town on the Amazon River. And cheap. Our lodging cost us $9 per person per day, on a quiet dead-end street that ends at the river. The roads of Iquitos are traversed by "moto-taxis" instead of cars, like 3-wheeled motorcycles with go-cart engines (see picture at top of post). For half a dollar, a mototaxi will take you anywhere, darting through town at break-neck speed. A first-class thrill, better than any carnival ride. I love Iquitos. I would move there next week if I had a job there and I'm not kidding. After a few days in charming Iquitos, we took a boat to a very remote biological station about 90 river-miles from Iquitos. We went east on the Amazon and south on its tributary, the Orosa River. The biological station, Madre Selva, is operated by Project Amazonas, a conservation and humanitarian non-profit. The station provides "rustic" lodging for biologists studying Amazonian plants and animals. Project Amazonas also offers some medical aid to remote families and under-served villages on the rivers. At the biological station, we slept in tents on raised wooden platforms under a thatched roof. Thatched homes with open sides are traditional in Amazonia. Every single house you pass on the river is built that way, and on stilts, which protect against flooding - because Peru has a rainy season and a dry season and water levels fluctuate dramatically. Summer in the U.S. is Peru's dry season, good for travel. Especially July and August. Photos: Our housing at Madre Selva, outside and inside. Our house had screen walls, but most homes don't. We loved the local indigenous children who paddled over to the station every day in their dugout canoes. When their mothers came too, they brought stuff to trade: woven baskets, bags, fans, carved jewelry. The moms welcomed what we offered: lotion, mosquito netting, toothpaste, socks, shirts, anything. Sometimes the children brought their "pets" to show us: lizards, turtles, and even monkeys! This was not at our request, and we were uncomfortable seeing wildlife as pets, especially the primates. But as we learned, people living in remote places along the Amazon do keep wildlife as pets. We saw plenty of wildlife for sale as meat too, back in Iquitos, which made us equally uncomfortable. But we were grateful to have the chance to talk with the families around the biological station. Above photo: A group of sisters brought us a little frog in a baggie (which Sadie released into the forest). Right: Another family brought their two pet monkeys to visit with us, just to be neighborly. The monkey pictured is a monk saki monkey. Captive wildlife often winds up in Iquitos. Part of Iquitos is a floating shantytown of huts built on rafts that rise and fall with the river. The floating area of the city, called Belen, has an extensive and colorful open-air market on the shore, which offers every imaginable jungle resource. It's an exotic sensory deluge, crammed with foods and spices and jungle products I've never seen before. It reminded me of Diagon Alley in the Harry Potter books for some reason, maybe because of all the traditional medicines for sale, made of plant and animal parts. (The use of animal parts to treat ailments and impotence worldwide is based almost entirely on superstition, folklore and tradition. I don't know of any animal parts that have been demonstrated to be effective medicine.) The part of the Belen market that offered traditional medicines was troubling, and fascinating. As I've written elsewhere, the trade in wildlife and wildlife parts worldwide is the third most lucrative blackmarket commodity in the world, after drugs and arms (according to Interpol). I saw traditional medicines made of animal parts while visiting a medicine man in a remote village in South Africa last year. He had a few animal tails and skulls, and some unidentified animal parts in jars, but his collection of animal parts was meager compared to the array on display in the Belen market. We also saw baby monkeys for sale in the Belen market, for 5 soles, about $2 each. I was stunned at that. These were saddle-backed tamarins, spider monkeys, pygmy marmosets, animals whose habitats and population numbers are declining, and who should be protected. There were more than monkeys for sale....living anteaters, parrots, and sloths, too. It was distressing, yes, but if it's happening, I want to know about it. I was grateful for the opportunity to see it for myself, and grateful to our guide Cesar Pena for taking me there. Cesar has been a nature guide on the Amazon for Project Amazonas for 12 years. He works independently too. If you're interested in hiring him as a guide on the Peruvian Amazon, contact him directly at cesars99@hotmail.com. His phone number in Iquitos is 965-658361. To call him from the U.S., dial 011.51.65.965658361. Rosa was a life-saver in planning our trip. Maybe literally. Before this post gets too long, I want to recommend an excellent resource for anyone considering a trip to Peru. Rosa Vasquez Zanetti. Her family owns and operates the modest little inn where we stayed in Iquitos, the Hospedaje La Pascana. Rosa is also an excellent travel agent, through her own Pascana Amazon Services. Not only did she make a number of our bookings before we arrived in Peru, she also helped me change some of our Andes plans at the last minute while we were in Iquitos. She recommended some safer means of bus travel into the mountains for us, and booked the tickets. She also recommended safer and more interesting mountain towns and Andean peaks for our hiking plans, and she booked those too, while we were in Iquitos. She was a fantastic resource and speaks very good English. You can contact Rosa directly at reservas@pascana.com or call her in Iquitos. From the U.S., her number is 011.51.65.233466. I'll write another post about what we did in the Andes. I want to recommend too a Peruvian driver that we hired to drive us from Lima to the Reservas de Paracas, a mind-blowing desert nature reserve 4 hours south of Lima. Devon Graham of Project Amazonas recommended both Miguel and Rosa to us. Miguel stayed with us the entire 56 hours or so (two nights) that we spent in the area of Paracas. When we left the car to go birding, he stayed with the car to guard our things. His name is Miguel Quevedo. He's smart, responsible, trustworthy, fun. On many occasions, he acted as our advocate - straightening out misunderstandings with vendors, etc. Miguel can be reached through Rosa Vasquez Zanetti (she will call him for you if you email her at reservas@pascana.com.) Or you can call him directly, but he speaks little English. His phone number in Lima is (511) 99664-1254. If calling from the U.S., it's 011 511 996641254. More later on Peru, and why I long to get back there. Are you a vegetarian or vegan in the Charlotte community and surrounding area that would like to get to know others in the area? Would you like to learn more about which local restaurants have food we can eat? Would you be interested in monthly dine-arounds? Are you thinking of becoming a vegetarian or vegan and need a support group? If so, email me at charlotteveggies@gmail.com to join the Vegetarian/Vegan Club of Charlotte. Our avocado-colored washing machine is 20 or 30 years old; we inherited it years ago and it was old even then. We've been expecting it to break down for a long time, but it keeps plodding on dutifully. Still, we feel like we should replace it with a more energy-efficient and water-conserving model. Although we'll plunk down some change up front, a new washing machine will save us money on electricity and water bills But how can we tell which new ones are the best in terms of energy efficiency? Tons of products make "green" marketing claims that I've learned not to trust. You might know about the EPA and Department of Energy's Energy Star program. The program identifies appliances that meet federal energy-efficiency standards. According to the Energy Star website, appliances with the Energy Star logo can reduce household energy consumption and greenhouse-gas emissions by 33%! The Energy Star website says this efficiency saved consumers $12 million in electricity bills in 2005 alone. That same year, the use of Energy Star products reduced the USA's greenhouse-gas emissions by an amount equivalent to 23 million cars – the same as if one car in ten were retired. Sounds pretty good. A lot of major brands have models that qualify for the blue Energy Star logo. The Energy Star website has search engines for different products and stores that carry them. So what about washing machines in particular? According to these green building guidelines from California, Energy Star washing machines use 50% less energy and 45 to 60% less water, but perform as well as conventional washers. For maximum efficiency, these guidelines recommend models with a water-factor rating of 6.0 or less. 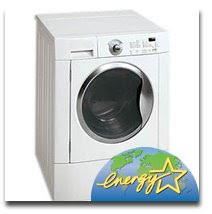 Most Energy Star washing machines are front loaders. They not only wash and rinse with less water but most models have a high-speed spin cycle that removes more water than conventional models, thus saving energy on drying. The websites listed below are helpful sources of information. For the present, before we choose a new washer, I'll keep trying to reduce our energy use by washing only full loads and by washing in cold water. And even after I get the new washer, I'll keep hanging the clothes on the line to dry. Yeah, they get bird poop on them now and then, but what the heck. The little gobs flake right off when they're dry. The trick is to bring in the clothes as soon as they're dry. The longer they stay out, the greater the chance they'll get bombarded. See our new book, Going Green, for more information on energy-saving appliances and other environmentally-friendly consumer choices.